The Star – Nov 16, 2016 – Robots assemble and cook the pies; at peak capacity, they can make 288 every hour. The automation doesn’t stop in the kitchen: The delivery-only pizza joint has special patented food trucks that bake your pizza en route, in an oven that turns on automatically three and a half minutes before the truck delivers it to your house after following an algorithmically optimized route. It eliminates dwell time, which is pizza-biz lingo for “that horrible time when it’s in a cardboard box in the back of a Camry,” said Collins. She foresees a fleet of cook-en-route delivery vehicles serving people across the country, and not just bringing pizza. Zume can have the food at your door minutes after you place the order, by front-loading the truck with the most popular pizzas and circling neighbourhoods on busy nights. 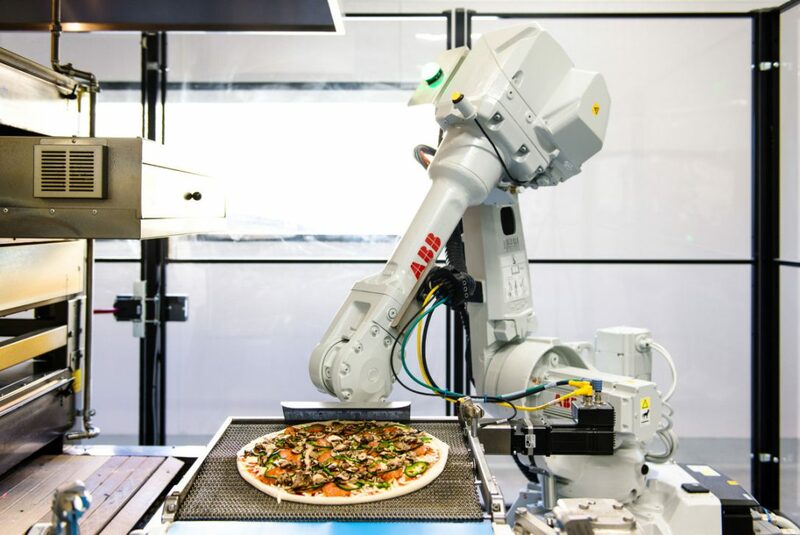 Pizza isn’t the only food that’s getting a robotic boost. Momentum Machines announced plans to open a robot-operated burger joint in San Francisco, with systems that will allow diners to customize their blend of ground meat. There are robot noodle makers in Japan and robot cocktail makers in Italy. Casabots in San Jose has invented Sally, the salad robot — she’s essentially a fully contained, mechanized Sweetgreen — and they’re setting their sights next on burritos. Even the San Francisco Mission District’s artisanal darling Tartini has discussed automating its bread baking. Technology yet to come could further blur the artisan-robot divide. There are already robots that can quantify taste. One was created in Thailand in 2014 to combat the adulteration of flavours in Thai food and to set standards for the taste of classic dishes. And an engineering PhD student at Berkeley has been exploring the use of virtual reality to teach robots human motions. A human wearing a VR headset could demonstrate culinary tasks, such as knife use or deboning a duck, that the robot could emulate. Eventually, those robots could be able to prepare entire meals in the style of their teachers. Your grandma could cook for you, even if you live continents apart. To take it a step further, put the VR system on a celebrity chef like Thomas Keller or René Redzepi, and you could program a French Laundry, or Noma-style meal. And when scientists are able to further customize indoor agriculture, could chefs in one part of the world replicate the terroir of another? If so, Smith posits that a dinner in Kansas City could taste even more like a night at Noma in Copenhagen. And, of course, there’s the impact on the labour market. Major chains such as Pizza Hut and Carl’s Jr. have pondered robotic labour, partly as a way to avoid paying an increased minimum wage. Mark Erickson, provost at the Culinary Institute of America, said he isn’t worried about preparing students for a career working alongside robots. He pointed to data that indicate a labour shortage in kitchens (though some economists disagree that it exists). Robot labour could eliminate low-skilled jobs and lead to the creation of more technical jobs, such as robot maintenance. Zume, for example, gives all of its employees a stake in the company and technical training. Collins said workers whose jobs become automated will be reassigned, not eliminated. And Zume’s kitchen will always require someone to prep and load food into the robots. Guests can customize salads via a touchscreen, and the robot will dispense them according to weight, with a precise calorie count. Sekar is also in the process of signing up a celebrity chef to come up with specialized salads. The robot is being tested at Stanford University, among other pilot customers in the restaurant and hotel industry. Because initial models are designed to replace unstaffed salad bars at cafeterias, Sekar does not anticipate that Sally will take anyone’s job. The District of Columbia will get a taste of the Bay Area’s high-tech dining with the opening of an Eatsa location at 1627 K St. NW this fall. The vegetarian restaurant specializing in quinoa bowls is a modern take on the early-20th-century trend of Automats, which were, essentially, room-size vending machines. It’s perfect for people who like to get their food without having to interact with another human: You place your order on a touchscreen and wait for it to show up in a computerized cubby with your name on it. It’s sleek, sterile and full of flashing screens, kind of like an Apple store that sells mushroom teriyaki bowls instead of iPhones. The lone front-of-house employee seems to be responsible mostly for taking out the trash.